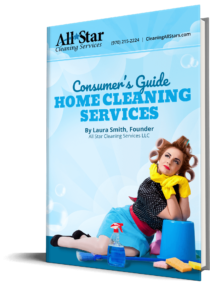 Most people have a large collection of cleaning supplies – after shower spray, soap scum remover, rust/limescale remover, soft scrub, scouring powder, glass cleaner, toilet bowl cleaner, disinfectant spray, floor cleaner. Sound familiar? And that is just for the bathroom! Really only a few products are needed to get the job done. Why do people collect cleaning supplies like it’s a hobby? Everyone is looking for the magic bullet – the one product that will clean the bathroom for you, effortlessly. I think I’d better make this one a mini-series. Look for more posts in the coming days detailing how having the right tools can help you make the switch to natural cleaning painless.